The time is right, since the technology is perfected and PROFINET is already integrated into many newly developed devices and components. In particular, PROFINET presents many opportunities for production optimization through higher performance, use of PROFIenergy, or integration of wireless networks. At the same time, the migration has been made as easy as possible for users. Users don’t always jump up with enthusiasm when a new technology comes on the market. “Is the new technology already perfected for real-world use?” Are there really benefits? How long will it take to change over?” Such are the questions that no doubt many companies deliberate. 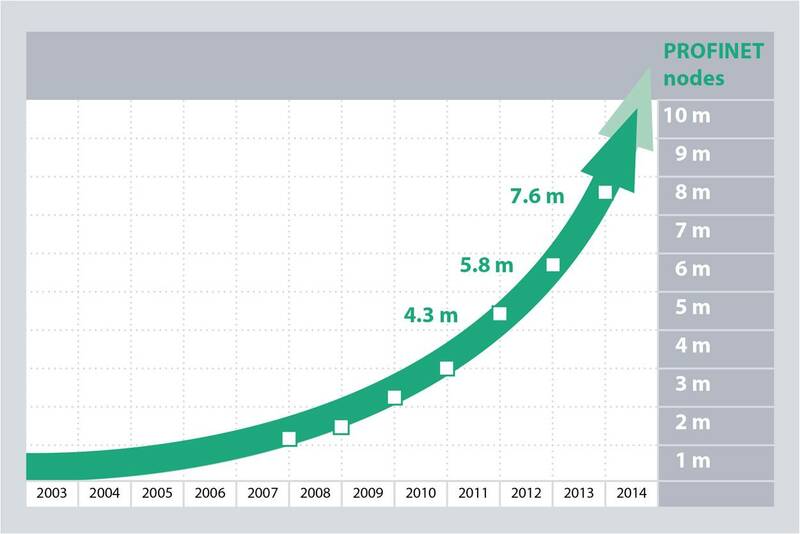 All the more amazing then is the growth of PROFINET in recent years. In 2012 alone, it grew by 35%. This growth is much more dynamic than that of PROFIBUS when it was introduced on the market. In particular, PROFINET has experienced much stronger growth when compared with the general Industrial Ethernet market. Experts estimate that in just a few years there will be more new PROFINET nodes than PROFIBUS nodes. One reason for this success can be attributed to the fact that the technical requirements for migration or introduction to the PROFINET world are not overly demanding. There are also numerous ways to optimize costs. Moreover, many are using PROFINET in order to benefit from PROFIsafe or PROFIenergy. Existing systems based on PROFIBUS DP can be easily ported to the new standard either gradually in logical, reasonable steps or all at once. With a step-by-step strategy, it is also possible to give optimal consideration to operational requirements (changeover during lower production times, several machines/lines in succession, etc.). In the simplest case, a higher-level PROFINET IO controller is installed in place of the previous controller, the head modules of the distributed I/O are replaced in the field, and the system components are networked together by PROFINET cable. The key advantage of PROFINET is that process, safety, diagnostic, and IT data, such as standard TCP/IP frames, are transmitted over the same cable, which drastically simplifies installation and management. For connection of other fieldbus systems (e.g., CAN-Bus, Interbus, DeviceNet), there are a variety of proxies that act as a representative of a PROFINET IO device in PROFINET. These are explicitly defined in the PROFINET specifications as well as standardized. Individually customized solutions and their associated costs are eliminated. It is just as possible to use PROFIBUS components on new PROFINET-based machines without any restrictions, if individual PROFIBUS DP slaves are not yet available with a PROFINET connection. This enables a smooth migration in line with the requirements of the respective applications. Special gateways for actuators and sensors are made available by providers for this. Although further development of PROFIBUS technology can no longer be anticipated, the fieldbus system and components will continue to exist in a large number of applications. When it comes to new technological development and innovation, priority is naturally being placed on PROFINET. For new components, PROFINET will be the standard interface, while PROFIBUS will remain optionally available. What will be different after migration? The key difference between PROFIBUS and PROFINET is most assuredly the network concept. Users now have many different options for designing their automation landscape, perhaps by introducing new network structures, using PROFIenergy, or integrating wireless applications. Of course, this new freedom should be exercised carefully. For large networks in particular, detailed network planning will provide for a stable, high-performance network. A comparison of PROFIBUS and PROFINET installations reveals definite differences. This starts with the number of devices. A PROFIBUS application in machine construction typically has 50 to 100 devices. Thus, PROFIBUS users generally operate in a manageable world. In PROFINET networks, this can look completely different. For example, networks with 5000 nodes already exist in the automotive industry today. But, it’s not just the number but also that type of networks that is completely different. There are different network structures (Class C networks, Class B networks) and dynamic network structures, for instance in robots with frequent tool changeover. Moreover, networks are changed and expanded during operation. The networks are oriented vertically as well as horizontally and don’t always have to be purely a PROFINET network. Integration of existing PROFIBUS networks is a daily practice, just like operation of standard Ethernet devices with simultaneous integration of a multi-axis system requires real-time communication. Depending on the application and existing infrastructure, it is appropriate to use different types of networks structures. However, up to now a uniform tendency of the type of network to be implemented by users in the future has not been solidified. Is the preference to work with multiple small manageable networks or one large network? Still, like for PROFIBUS for which installation instructions for easy commissioning have been available for years, the working groups at PI have already created comparable documents for the use of PROFINET. However, these no longer cover just the installation by itself, such as branches, connectors, and the like. Rather, additional aspects such as layout variants and security measures are also emphasized. What are the benefits to users from migration to PROFINET? This can be divided into three categories: flexibility, efficiency, and performance. A key benefit of PROFINET is its significantly higher performance, especially with regard to node count, transmission speed, and diagnostics. Up to 256 nodes on one controller are already possible today. The size of networks is virtually unlimited. And the speed at 100 Mbps and full duplex mode of PROFINET is faster than that of PROFIBUS at 12 Mbps in the best case by an order of magnitude. The two real-time transmission modes of PROFINET – RT (Realtime) and IRT (Isochronous Realtime) with clock synchronization – enable highly dynamic applications with deterministic cycle times. The latter pertains to clock-synchronized motion control applications, such as distributed drive links with cycle times down to 250 µs. Such applications are only possible with PROFINET. In addition, with cycle times as short as 31.25 µs, PROFINET provides even greater performance reserves for even more stringent requirements. The resulting increased control accuracy yields more consistent product quality and/or higher output. Another reason that migration to PROFINET is such a smooth process is that any errors that occur are indicated immediately thanks to sophisticated diagnostic tools. Typical errors that occur over and over during commissioning and operation are incorrect address configurations and out-of-date firmware versions. It is also common for there to be discrepancies between configured devices and the devices that are actually installed. Undefined network loads caused by mixed networks may also pose problems. This happens more often in the case of vertical integration by MES and ERP systems or integration by OPC servers, engineering systems, and webcams. PROFINET already delivers information regarding such discrepancies or errors to your door. Expanded, local, and intranet- and Internet-based diagnosis options, e.g., using web servers on the controllers, simplify commissioning and are also a key factor in maximizing the availability of a machine, system, or factory. As a general recommendation, for each pending automation project the individual requirements should be compared with the many different possible PROFINET solutions before making a decision. In most cases, the advantages will outweigh any disadvantages – even for projects with a limited scope. For example, the investment costs are amortized faster over the service life of a PROFINET installation due to the shorter commissioning time and the higher availability, productivity, and quality of production. Energy savings that can be achieved during production pauses with PROFIenergy also contribute to this. With continued growth of device counts and (as with PROFIBUS) broader dissemination of additional functionalities, the Total Cost of Ownership (TCO) of PROFINET systems will decrease even more. PI (PROFIBUS & PROFINET International) offers comprehensive support for migration, ranging from technology workshops and Competence Centers to manufacturers and users that have accumulated a wealth of experience. In the end, this is one of the greatest strengths of PROFINET: Behind the technology stands a large community whose common goal is efficient production.